The picturesque North Mountain Forest Park in Xining is a popular destination for both tourists and locals, with white clouds rolling endlessly over the green and high mountains, twittering birds and fragrant flowers dotted in the thick forests that spread around the grassy slopes. A river, gurgling from the uplands, runs along pavilions and bridges, then into a deep blue lake in the distance. The scene may be common on the plains in southern China, but the setting is in fact the capital of Qinghai province, the largest city on the arid and freezing Qinghai-Tibet Plateau. The city has gone through a sea change over two decades, as its green coverage ratio surged from 7.2 percent in 1989 to 75 percent today. "Once, the mountains were all yellow; now, you see that they are green," Wang Zhi said as he gazed into the sea of trees. 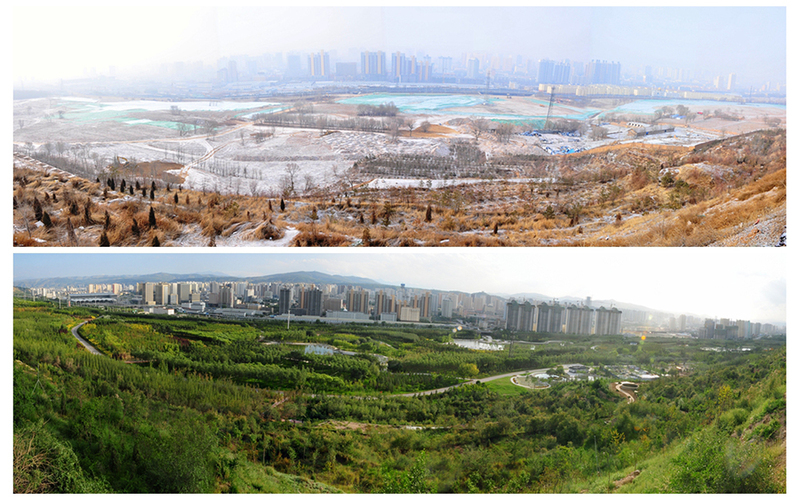 The director of the Xining Forestry Administration has had a front-row seat to the city's dramatic green transformations, right from when Xining launched its afforestation campaign in the north and south mountains in 1989. "People in Xining rely on the weather for their livelihoods," Wang said that frequent sandstorms, brought by severe wind and soil erosion in the mountains, severely impacted the residents' quality of life and social-economic development. The pollution and depletion of the nearby Huangshui River beginning in the early 1990s caused further environmental degradation. Thus, planting trees, as one of the best ways to preserve water and soil, has been high on the agenda of the government's plans. Wang said the government invested 13.5 million yuan (US$1.98 million) on the afforestation campaign of the two mountains in 1989 — a large sum for an environmental project at a time when many provinces in the country were focusing on trade.